Killa’s Garage – Sharing bicycle-related services, training, and advice in an up-close, hands-on, inclusive, non-commercial atmosphere. If you are ever offered the opportunity to work on an extra large time trial bike with an internally routed rear hydraulic rim brake below the bottom bracket, turn around slowly and run like hell! I’m joking; it was a great experience but it was challenging, and by the time I finished I knew I’d write a post about it. My friend (Let’s call him Flywheel), brought me his bike for some service. This bike is a slippery speed machine. Everything is internal or shrouded. It’s quite aerodynamic. But this design is less than ideal when it comes to service and repair. Among a few other relatively easy tweaks, the bike had a frozen rear brake. As the brake caliper was located below the bottom bracket I can’t say I was surprised. If you’ve been reading my blog you know how I feel about brakes under the bottom bracket. And Flywheel is a big guy, over six feet tall and solid, so good brakes are important for him. At least here in the Houston area we don’t have any serious downhills. I think I’ll organize this conversation in reverse order – “A below the bottom bracket hydraulic rim brake that is internally routed on a time trial bike, size extra large”. Here’s a picture taken after reconstruction, nice and clean! This is just a bad idea! Hey, let’s put a piece of safety critical equipment under the bottom bracket – the dirtiest place on the bike. At least on this bike there was a shroud covering the brake, though this was for aerodynamic effect and was obviously ineffective at protecting the brake from water and debris ingress. I think this is an interface problem. The brake manufacturer makes some assumptions about the location and orientation of the caliper on the bike. For instance, on another bike I serviced, the caliper return spring is located in a pocket that effectively forms an upward-facing cup when mounted below the bottom bracket. Put that brake on the seatstays or fork and the pocket easily sheds debris and water. Below the bottom bracket it collects them! I think that if they were designing a brake for mounting below the bottom bracket, they would build it differently. On Flywheel’s bike, there are no upward facing cups, but there are unsealed thrust bearings on the pivot studs each containing ten 1/16” balls. Upon disassembly I found forty rusty little lumps of steel. I replaced the bearings and restored the mechanical function of the brake. What does it mean: “Do not disassemble; no user-serviceable parts inside”? And here’s a picture of a fully functional thrust bearing of the same design from a ten year old Campy Record fork-mounted front brake. These bearings can last in the right environment. Now you’re wondering how I came to be disassembling a Campy Record fork-mounted front brake. Well, the return spring broke, but that’s a subject for another post. Anyway, I got the brake bled and restored hydraulic function, but that proved to be short-lived for reasons as yet unknown. I hope Flywheel lets me work on it some more. OK, on hydraulic rim brakes the pads are farther away from the hydraulics and therefore less likely to get fluid-contaminated. That’s about the only benefit I can name for hydraulic rim brakes. 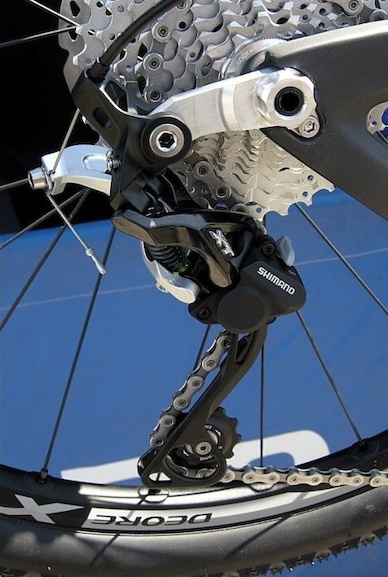 Hydraulic disc brakes eliminate the (flexible) lever arms and cable friction. The hydraulic rim brakes on this bike do eliminate the cable friction, but they leave a rather Rube Goldberg mechanical system in place. Watch this one minute video of the brake in action. 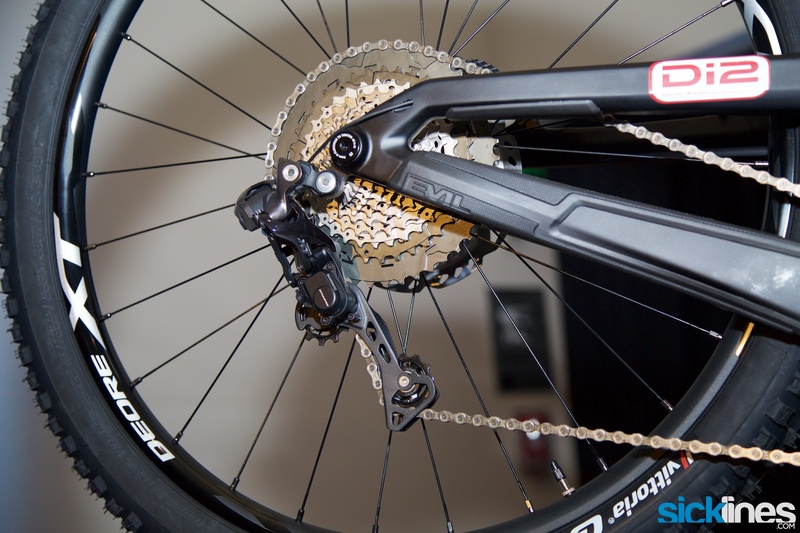 SRAM hydraulic rim brakes at least employ a simpler, probably stiffer, mechanical system. SRAM Red HRR brake caliper – note the adjuster barrel and release tab. It looks very much like a mechanical rim brake. You can even see the end of the return spring sticking out from behind the left arm. Hydraulic disc brakes self-adjust for pad wear. Hydraulic rim brakes don’t. 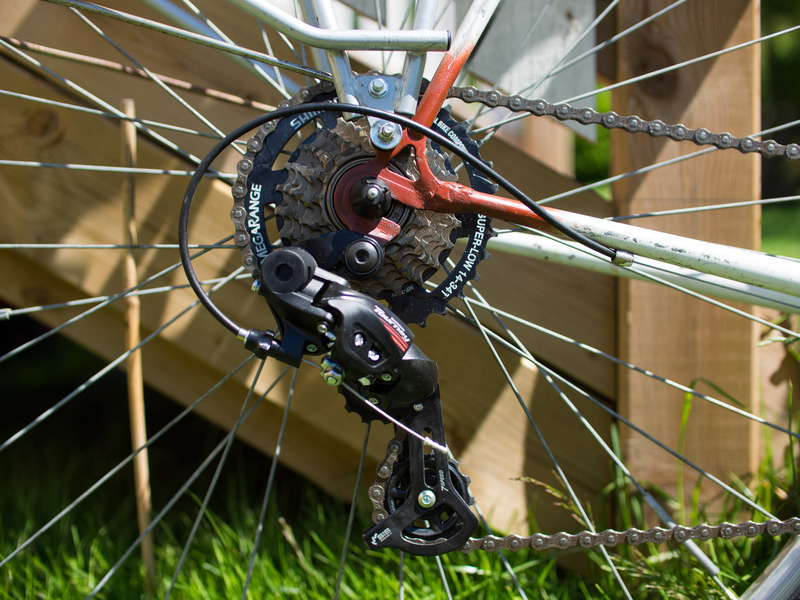 Also, hydraulic disc brakes eliminate the need for return springs. The minute amount of piston retraction in a disc brake is courtesy of piston seal elasticity. Hydraulic rim brakes require a much larger range of motion, the same as mechanical rim brakes, so return springs are still required. I just don’t see a compelling need for the addition of hydraulics to a rim brake system. I think fitting rim brakes with hydraulics was a step in the long range conspiracy …I mean plan… to introduce disc brakes to road cycling. To reference an imperfect analogy, we have moved past hydraulic rim brakes the way we moved past CFL lighting. Man, wouldn’t you hate to have been the owner of a CFL factory when LED lights came out. Anybody remember HID bicycle headlights? As a mechanic, internal routing just makes everything harder, with hydraulic systems doubly so. Aside from the normal difficulties of tracing and fishing cables through a frame, doing so usually requires cutting off the “olive” terminations and fitting new ones, a much more tedious and error-prone operation than routing standard brake cables. It’s a shame that all the cockpit wiring is so neatly tucked away except the last bit to the button box. I really have nothing much against time trial bikes. I don’t own one and I don’t want one, but that’s just me. My only complaint as it relates to this post is those cute little aero brake levers with their limited travel. They never work very well, and I think there a few flaws in the design of these specific levers, but that’s beyond today’s scope. And that’s all I have to say about that. I eventually got everything sorted, put on the wheels, and realized I couldn’t even straddle the top tube, or reach the pedals from the saddle, even with the saddle all the way down. I had to test-ride the bike standing in front of the saddle! That’s a picture I’m glad I don’t have. Hey mechanics, how do you road test a bike that is too big to ride? PS: Sorry if I sound annoyed. I’m not. Really. I enjoy this stuff. I promise not to rant so much in my next post. Author KillaPosted on December 18, 2018 3 Comments on How Many Standards Do We Need for Bicycle Rear Axle Size? I never meant for this to become Killa’s Esoteric Observations on Aluminum Corrosion blog, but here we are. In a recent post I wrote about a corroded stem face plate on a friend’s bike. Another episode of aluminum corrosion was brought to my attention recently in a pretty spectacular manner. Pardon a brief diversion to the topic of bicycle wheel engineering. Mario reported to me that despite absorbing enough force to buckle his frame tubes, his front wheel remains absolutely true! Back to aluminum corrosion. This is not an article about the crash, but rather about the cause. The primary cause of this crash was, in my opinion, a corroded handlebar. The bicycle of RocketMan ended up in my garage because, well, I’m the guy’s mechanic. Both drops (Drops are the lower curved ends of road bicycle handlebars) of his aluminum handlebars were broken. The right drop was completely broken off, the left was still attached by about a quarter of the circumference of the aluminum tube. Aluminum bars usually bend. They don’t usually break. And RocketMan fell on his left side, so how did he break the right drop? 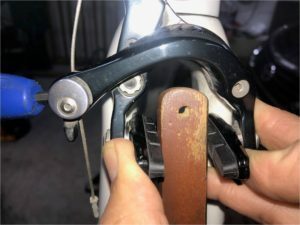 I only had to un-wrap his handlebar tape to see that corrosion had eaten through most of the metal just above the brake levers – exactly where sweat drips off your hands and collects under the tape. 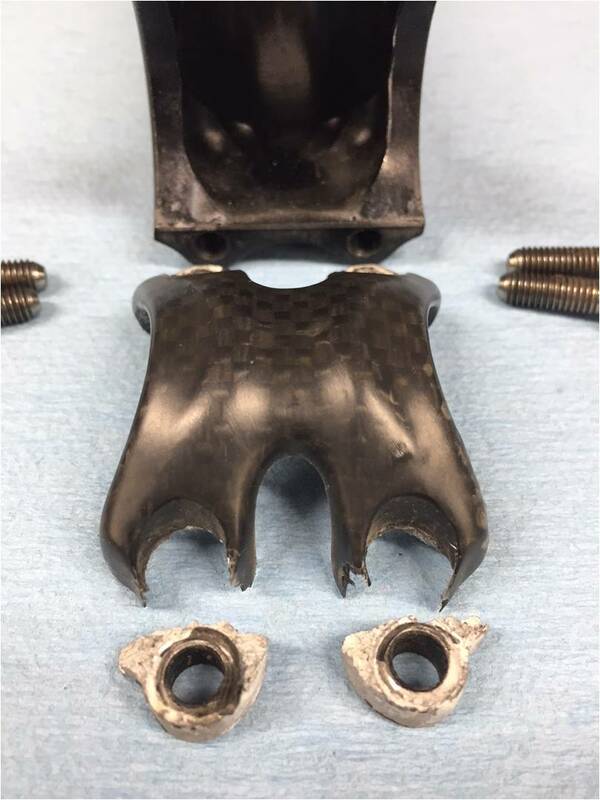 What I think happened to cause this crash is that RocketMan hit a small bump while riding on the drops, or corrosion simply reached a critical level. I think his right drop broke off first, causing him to lose control and fall. The left drop, I think, broke on impact with the ground. The evidence suggests crevice corrosion just like the stem face plate I wrote about previously. Here the interface between tape and handlebar creates the crevice, and sweat is the electrolyte. That white stuff is not salt, It’s aluminum hydroxide. And there was a lot of it under the tape! I’ve seen plenty of corroded handlebars over the years. I’ve seen scary-corroded bars that I thought would crumple like paper that I couldn’t bend or break. These were the worst I’ve ever seen. A metallurgical analysis of the remaining metal would be very interesting, for a certain definition of interesting. Some riders will go without changing tape for five years. (Oh, you’re supposed to change it?) RocketMan’s bars had been taped up and ridden for about 15 months, not unusually long, but most of it in very sweat-inducing Texas heat and humidity. How much do you sweat? How often do you look under the tape on your bars? Inspection, inspection, inspection. Look under your tape every six months or so, especially if you ride in hot humid climates. It’s relatively easy to un-tape back to the levers and re-wrap. Or just go ahead and change tape more frequently. It’s pretty cheap, and everyone knows that new tape makes you faster. This is a result of the well-known “New Stuff Principle”. Change your handlebars if they’re corroded. I’ve never been a fan of carbon fiber handlebars (because they tend to break on impact rather than bend) but at least they don’t suffer from this insidious failure mode. It’s something to consider if aluminum bars don’t last for you. By the way, RocketMan is a retired space shuttle astronaut. 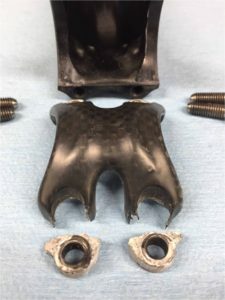 In one of those cosmic coincidences of life the aluminum oxidation process that caused his crash is the same chemical reaction that powered his Space Shuttle solid rocket boosters. Scan the picture at the top of this article quickly. What jersey would you rather be wearing on roads full of distracted drivers? About ten years ago a good friend of mine confessed that he always wears a fluorescent yellow jersey when he rides his bike. At the time my collection of jerseys included – like many of you, I’m sure – an assortment of team colors and charity ride commemorative tops. I felt that, well, hi-viz yellow is kinda’ dorky. I didn’t tell my friend that, of course. But I remember the conversation like it was yesterday, and it started me thinking. Then about five years ago another friend described his observations concerning jersey color during a cross-country ride from Seattle to Miami. He noticed that in a group of riders a mile or so up the road, the only rider he could always spot was the one in hi-viz yellow. The rest, in various team kit colors, might as well have been wearing camouflage. Road-camo he called it. That conversation convinced me. I’ve been buying nothing but hi-viz yellow jerseys ever since. I still have some road-camo jerseys, and I still wear them when my hi-viz yellows are dirty, but I wear the yellow whenever I can, and I’m tossing the older jerseys as they age. I also found a deal on a six-pack of bright yellow socks (six pairs, twelve socks, Pearl Izumi if you must know). I wear these socks exclusively when I ride. I think that my yellow-clad ankles bobbing up and down provide a strong association with the concept of cyclist in the minds of drivers. I also like to think that this association will cause a driver to avoid me rather than run me down. What do you wear when you ride? Fluorescent yellow is great in daylight, but at night it just looks sort of gray. You need lights and reflective surfaces when it’s dark. Retroreflective material is that silver-looking stuff sewn into the seams or in patches on some clothing. It’s amazing stuff. Try taking a flash picture at night of someone wearing a patch of retroreflective material. You can’t. The stuff throws so much light back at you that it ruins your exposure, leaving everything else in darkness. Reflectivity is great, if the car/bike/runner/hog/deer hurtling toward you has lights. If not, there’ll be no light to reflect. You need active lighting. Red in back and white in front seem appropriate. I’ve no data to back this up but I believe this color choice helps orient you in others’ minds as approaching or receding. I don’t know what the hogs and deer think. You also need a headlight to be able to see where you are going. Hogs and deer don’t wear reflectors. There are lots of affordable rechargeable lights available that will throw enough light to see and be seen. I like at least 400 lumens in front and 100-200 lumens in back. Once you’ve made the investment in rechargeable lights, why not run them in daylight too? Most of these lights will run for many hours in flash mode, and they’re bright enough to garner attention even in sunlight. Did you notice the headlight in the picture? Taillights, in my experience, are highly directional. Be sure yours is aimed towards the rear, maybe slightly left (slightly right in England?) and level. If you clip your tail light to your seat bag or clamp it to a seat-stay, there’s a good chance it is pointing to the ground or up into the eyes of the rider behind you, and not back down the road. Do this: Lean your bike against a post or something, turn on your taillight, and walk back about 100 feet. What do you see? Move left, right, up, down. Adjust your light so the brightest action is where a driver would be sitting as he approaches you. Are you safe because you look like a construction worker in hi-viz yellow and you’re all lit up. No, you could still get hurt in a number of ways. But at least you’ve greatly reduced the chance of someone looking down at you on the ground and saying “Sorry, I didn’t see you”. Author KillaPosted on October 19, 2018 3 Comments on You look Great in Fluorescent Yellow! My personal insecurity comes out after an evening of wrenching in Killa’s Garage. I wake up at three AM unsure of whether I have properly tightened all the critical bolts on a friend’s bike. I can’t go back to sleep until I have sent my friend a note to check that whatever I worked on is tight. Most concerning for me are the cable fixing bolts on the derailleurs and brake calipers, especially on the brake calipers. I worry about this because as I am stringing up a component, I make a preliminary guess on cable tension then snug down the cable clamp bolt just enough to operate the component and check my guess. Then I loosen the bolt a bit, make any adjustment, and do the final tightening. This way I don’t mash the cable in more than one place. It is essential that I remember to perform the final tightening step on each clamp bolt. In case you were wondering, Shimano’s recommended torque for derailleur and brake fixing bolts is 6-7nm. So I walk around the bike with 4mm and 5 mm wrenches and talk to each bolt (all of them, not just the cable clamping bolts) one final time before taking the bike down off the rack. “Hello, front derailleur mounting bolt, did I loosen you today? Did I retighten you…?” I don’t think this means I’m crazy, as long as they don’t start talking back. Pro Tip for Cable installation: Don’t cut any cables until you have everything strung up and working. It is relatively easy to pull and re-thread an uncut cable. A cut cable will likely fray and become a throw-away. Pro Tip for Front Brake Re-Cabling: If you use a fork mount work stand as I do, you can’t make front brake adjustments with the bike on the work stand because, well, the front wheel is not there. Keep a block of wood (or something else) handy that is a little wider than an average rim. Use this block to make a preliminary adjustment of cable tension with the pinch bolt. Writing this post has given me two continuous improvement ideas: 1. Attach a small T-bar across the top of my wood block so it will stay in position without brake pad pressure. 2. Attach the block to my workstand with a piece of string so it is always handy. With a little practice you can get close enough on the first try so that you can make your final adjustment with the adjuster barrel alone. You still will need to center the brake with the wheel in place. But that’s easy if you follow my tutorial on Centering Dual-Pivot Brake Calipers the Right Way. I recently posted about my experience with SRAM’s ETAP system. It doesn’t have much by way of optionality. You click, it shifts. It will display current gear selection on an ANT+ device, and that’s about it. There is apparently a wireless communication protocol for firmware updates via a USB dongle, but SRAM has yet to issue any updates, so I’m just assuming that functionality really exists. Anyway my friend Dan, AKA 6-0, just got a Canyon with the newest Ultegra Di2 groupset. Talk about feature-packed. It can be set up for manual, semi-synchro, or full-synchro modes. 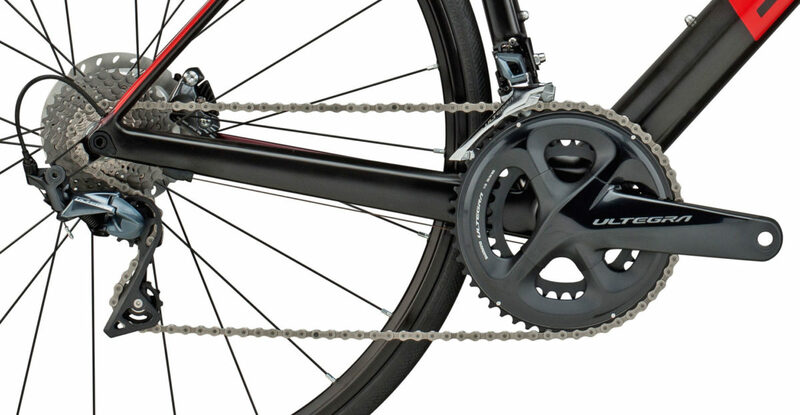 It will transmit to your display unit (Garmin et al) current gear selection, battery condition, and even a signal when it is about to change chainrings, because, yes, in Synchro mode it will change chainrings if required to get to the “next gear”. With so much optionality, it behooved (behove?) Shimano to design a connection to smartphones to make configuration changes, and sure enough they did. There is even a plug-in device to upgrade older Di2 to the new capability. But setup of all the wires and signals is apparently not exactly intuitive. This guide is intended to assist persons who have Shimano Di2 shift systems that are capable of communicating with bike computers via ANT+ and Bluetooth to smart devices. This requires the system to have Shimano [smart] batteries such as those found in the new Ultegra 8000 Di2 group set and the Dura-Ace 9100 group set. These may be internal or external to the bike frame. For Bluetooth communication, older Di2 systems must have their batteries upgraded to Shimano smart batteries, and install a small “D-Fly” ANT+/BT LE wireless unit in order to communicate with handheld smart devices (see Final Note at the bottom). Communicating with bike computers enables the rider to view various data fields related to the status of gearing, shift mode, and battery condition. 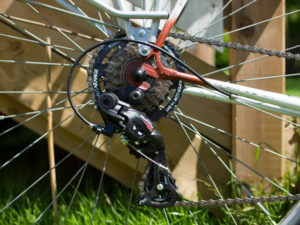 The Di2 system can also be periodically and temporarily connected via Bluetooth LE (herein also referred to as Bluetooth, BT LE, or BT) to easily update firmware or make programming changes to shifting methods and to button functions. This guide is not intended to explain the numerous ways that Di2 wiring configurations and connections may be made. 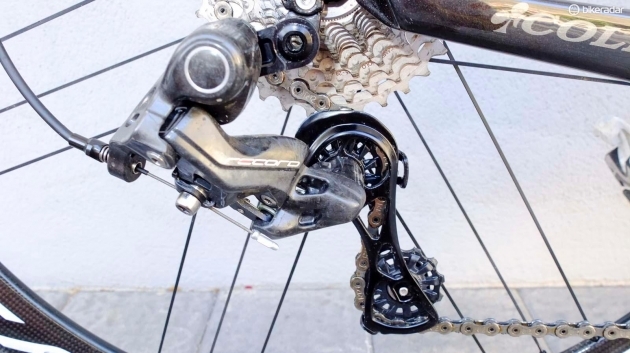 For that, the reader should consult the User Manual or Dealer’s Manual for Di2 shift system which is readily available online at Shimano’s website (see reference below). From reading user reviews (and by personal experience), connecting a smart device to Di2 for the initial connection has a high probability of failing during the initial firmware update. At this point, the Di2 system is likely to be unresponsive (“bricked”) and can only be restored by connecting with a PC and running the E-TUBE program. Wireless Unit – recommend “D-Fly” Bluetooth LE / ANT+ capable unit EW-WU111 (connection ports on opposite ends) or EW-WU101 (connection ports on same end). You will need an extra connection wire to insert the wireless unit into the system. Use the length appropriate to where the unit is installed. 150mm is the shortest available. Cheap ($4-$7) Shimano TL-EW02 tool recommended to avoid damaging connectors. Shimano USB unit and cable (Di2 battery charger SM-BCR2 or SM-PCE1 PC interface device) to connect the Di2 group set to PC computer. These connect to the Junction A box charging port and are only required to set up the system the very first time. They are not needed again if you plan on connecting via a Bluetooth smart device thereafter. E-TUBE Project program for PC. For smart phones and tablets, download and install respective E-TUBE apps (see References below). Install Di2 System Required items listed above, as needed. There are various ways to install them. Refer to appropriate manuals, diagrams, or YouTube videos for installing them. Ensure that the Di2 battery has sufficient charge prior to initial connection, especially new bikes and batteries. Ensure that the PC desktop will not accidentally lose power or shut down during initial connection. A PC laptop with a fully charged battery is better. Download and install the E-TUBE program to the PC. Ensure that the initial connection to Di2 is performed where the PC has a strong wireless signal and it is connected to the web. It will check online to find the latest firmware versions of all Di2 components and download newer versions if available. Install D-Fly wireless unit (and smart battery if necessary) in/on bicycle. Connect bike computer to the Di2 system via ANT+ to add Di2 communication between the two. Connect PC to the Di2 system via the E-TUBE Project program and run the program to view and make desired changes to Di2 gearing, shift speed, BT passkey, etc. Disconnect E-TUBE Project program via the program menu choice to turn off the Di2 system BT signal. Connect smart device wirelessly to the Di2 system via the E-TUBE app for it to view and make changes. Disconnect the smart device through the app settings as in Step 4 above. The shifters will not respond if the app and BT are still connected. Leaving BT on in the Di2 system rapidly drains the Di2 battery. When installing the wireless unit, do not complete the tie-down or closing up the access point until you have successfully communicated with your bike computer. You will have to disconnect the unit and reconnect it to complete the process (according to the User’s Manual for the EW-WU111 unit). After installing the wireless D-Fly unit to the Di2 system, put your bike computer into connection mode in the same way you did to recognize other ANT+ components such as speed and cadence sensors. Let your computer search for the Di2 device and then add it to your bike computer’s list of connected ANT+ components. You may wish to check data fields on your bike computer at this point if you have any set up. You may need to disconnect and reconnect the battery to complete the setup if you do not see any data. If you have an external battery, remove it and reinstall it. If you have an internal battery, disconnect the wireless unit from the system (at both of its ends to ensure that it is not still connected to the battery). Wait a few moments and reconnect it. Wait about 30 seconds for the wireless unit to begin transmitting again. Note: It may also take this long for you to see Di2 data fields populate when you start a new ride. You may finish physical tie-down or mounting at this point since you should not have to make further disconnections to the wireless unit. Or you may wish to finish this after making BT LE connections to smart devices. It is highly recommended that you make your very first connection using a PC and the PC E-TUBE program before connecting with BT using a smart phone or tablet. If you make the initial connection with a BT-connected smart device, it often fails while updating the firmware of the individual Di2 components. Since the PC is hard-wired to your Di2 system and there is no passkey, PIN, or code required to make the connection, there is little likelihood of failure during the initial connection setup process. The PC program also allows you to set the BT passkey that you can use later with smart devices. If you make the initial connection with a smart device, you will enter the default 000000 BT passkey, change it to a new one, update or attempt to update firmware, forget the BT device, connect and enter the new passkey, while risking failure and “bricking” the Di2 system. Connect your PC to the bicycle’s Di2 system with either an SM-BCR2 or SM-PCE1 to an SM-JC40/JC41 Junction A box through its charging port and a USB port on the PC, or an unused port on one of your Di2 system components. If you have an Ultegra 8000 Di2 system with a Junction A, connect your battery charger (SM-BCR2) cable in the charging port of the Junction A (SM-JC41) and the other end into a USB port on the PC. Other setups may require you to find an unused port on one of your Di2 components to connect an SM-PCE1 to. Run the E-TUBE Project program to update firmware and change other settings such as BT passkey code to a personal one. Note: Each Di2 component has its own firmware version. It may take a few minutes to check and update all components. This allows the user to employ various vintage Di2 components (“Frankenstein” setup) and still work. However, note the battery and wireless component requirements above for ANT+ and BT connectivity. 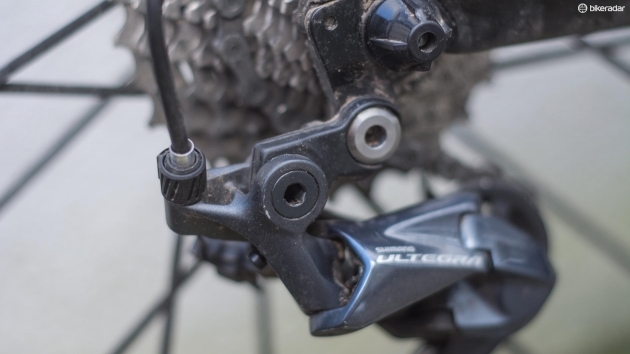 Shimano says that all Di2 components should work except the earliest generation. Shimano has a compatibility chart on its E-TUBE Project website (see References below). Disconnect the program using the appropriate menu item. You should now be able to connect via smart device BT connection. See Step 4 for this. To make a BT connection with a smart device (phone or tablet), ensure that its BT mode is turned on, start the E-TUBE app, and press the button on the Junction A box for about 1 second or until you see alternating red and green LEDs flash. The app will search until it finds the bike’s Di2 BT wireless signal and asks for the passkey. Enter the passkey you set up in Step 2 above. If you failed to set up a new passkey while running the program from a PC, the passkey will still be the default 000000. Enter that number. The app should ask you to set a new passkey. After setting the new passkey, disconnecting BT and closing the app, go to your smart device’s settings and forget the E-TUBE Project Di2 device since that is the only way to get rid of the default passkey on your smart device. Start the app again, press the Junction A button until its red and green LED lights alternate flashing, let the app find the E-TUBE Di2 system, and enter the new passkey. BE SURE TO DISCONNECT THE SMART DEVICE FROM THE Di2 SYSTEM THROUGH THE APP AND CLOSE THE APP. THE DI2 SHIFTERS WILL NOT WORK WHILE CONNECTED AND BATTERY DRAINAGE WILL BE ACCELERATED. It is advisable to read all component manuals, user reviews, and watch videos on YouTube to educate yourself on installation, troubleshooting, and programming of Di2 wireless components and bike computers. The wireless unit will work with Garmin, Wahoo, and perhaps other BT-capable bike computers. Please confirm that your bike computer will work with ANT+ Di2 before purchasing a wireless unit. Installing EW-WU111 to Canyon Aeroad 2018 This YouTube video shows how to install the transmitter inside the bottom bracket area of the bike on a Canyon Aeroad (Canyon Ultimate and Endurace Di2 bikes are wired the same). Please read the comments to the video since complications can arise fishing out the junction box as well as how to upgrade the firmware and reset the Di2 system after installing the transmitter. You will need snap ring pliers ($5 at Harbor Freight) to remove the plastic cover and a hook or needle nose pliers to fish out the Junction B box from the down tube. You should also use the small plastic TL-EW02 Shimano tool to break and make electrical connections. Best price on EW-WU111 and extension wire is at JensenUSA.com. The length of extension wire depends on where you place or mount the wireless unit and where the battery is located if you place it inside your frame. The cheap TL-EW02 tool from Amazon for 2-day delivery (as Prime member). Read reviews on the EW-WU111 on Amazon.com for discussion regarding installation and troubleshooting. Watch other videos on YouTube to see how to program for full synchronous shifting (using rear shifter), continuous shifting, programing shifters and hidden buttons, and connecting to bike computers. FINAL NOTE: I find the term “D-Fly” is confusing to me. I ask the question, is D-Fly the wireless unit, a bike computer that can communicate wirelessly with Di2, or is it simply the capability to communicate wirelessly between Di2 and a bicycle computer. It seems to depend on who is writing the article or manual. I find it best just to refer to the specific components being used, i.e., the wireless unit, the bike computer, ANT+/BT capable, etc.